So! My exhibition has passed and if I can say - it was a great success! It is truly inspiring to watch people enjoy your Art. And a feeling of being utterly grateful that they do is a big part of that inspiration! I was a co-exhibitor with my husband's cousin who was kind enough to fly in all the way from Mumbai, India to do the exhibition. If I may brag - we sold 17 pieces out of the 40 we had on display... between the two of us. I am humbled that I sold 8, and received an inquiry for a potential commission. Needless to say - this was the ultimate Artistic Adventure for me. It took 9 months to plan - between the time we booked the gallery to opening night. And there were so many times when I would wake up in the middle of the night; or when I would be in the middle of a painting and say to myself "What the hell are you doing?!" Not only was I nervous for myself - but here; I invited a family member to make an investment of plane tickets, a hotel AND all else! Then! 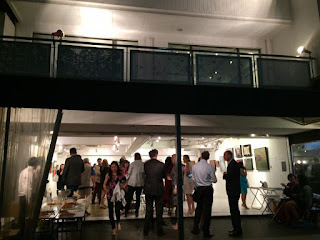 It was the anxiety of opening night... getting the paintings there - getting the food there (the gallery is in a neighborhood with small alleys - a car cannot always get through the narrow streets). But! We did it! Opening Night arrived and people CAME!!! That was the best part! People. Actually. Came. Granted, they were a vast and supportive circle of expatriate friends, work colleagues and community - but hell! It is still optional! And I found myself deeply humbled by the support and genuine appreciation for the Art that was hanging on the Walls. So.. I have to say THANK YOU. I. AM. BEYOND. GRATEFUL. I will leave you all with a few photos of the wonderful night and for a list of my pieces that sold - please visit my website www.Rshah-studio.com. fun once I figured out the composition for that canvas!